Welcome to Found Off The Street, our look at cars found on the cape that rust liked so much it decided to summer there; Cape Cod, MA. Today we have a 1962 Buick Invicta. This week's FOTS 1962 Buick Invicta and last week's 1964 Chevrolet Corvair may both be early 60s American made convertibles but their similarities end there. While the Corvair is no stranger to the weather and regular road use, this 1962 Buick appears to have led a significantly more pampered existence. When the sun starts shining every spring on the cape rust remembered pampered cars like this Invicta are awoken from their winter slumber. Buick first introduced the Invicta in 1959 as a combination of their Le Sabre body and the company's 401 V8 engine. The combination was Buick's sporty option that fit in between the Le Sabre and the top of the line Electra. Invictas were replaced in the Buick lineup by the Wildcat for 1963, although the Invicta name was still used on certain station wagons. 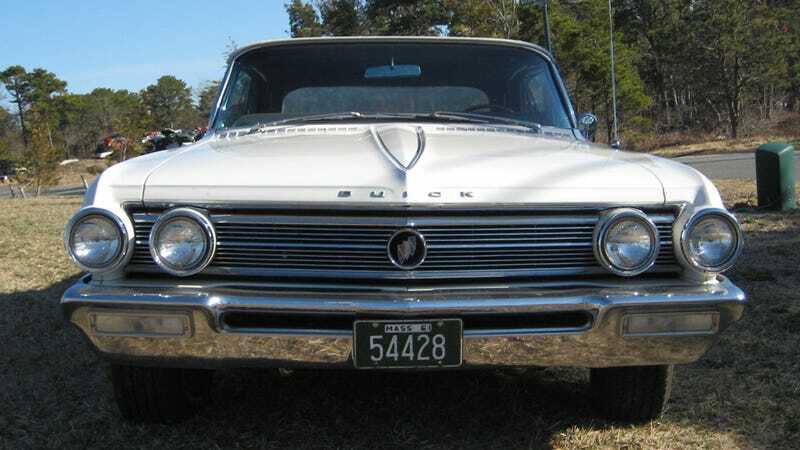 By 1964, the Invicta was gone from the Buick lineup entirely. While it only lasted a few years, I would argue the Invicta still ranks as one of the cooler car names ever dreamed up. According to Buick sales training materials the Latin derived name meant 'unconquerable, invincible, unbeatable'. Perhaps more important to Buick than its actual meaning was the fact Invicta sounded good, and still does over 50 years after it was introduced. 256,766 full sized Buicks were manufactured in 1962, but unlike many of the cars produced that year, this particular example has only traveled 67,000 miles in 49 years. The immaculate interior and general condition of this car tell the tale of a well taken care of and mostly original car. Underneath the hood of this Invicta is an example of the 401 V8 that all full sized Buicks left the factory with that year. Buick's 401 V8 produced an advertised 280hp in the Invicta that year. A 265hp version of the 401 was put in the entry level Le Sabre, while the top of the line Electra got 325hp from the V8. This particular Buick was spotted on the first sunny spring day on the cape that rust remembered. Sitting in the midst of an industrial park with a For Sale sign on it, it was clear the convertible hadn't seen any winter weather in a long time. Exactly how this Buick managed to travel 67,000 miles in its life is unknown but all signs point to seldom used summer car kept at vacation home, usually a safe assumption with low mileage cars found on the Cape. A set of Torque Thrust II wheels appear to be the only things that make this Buick anything but a totally stock and original car and get the thumbs up from me. Years of occasional random people whining about the Torque Thrust IIs on my own old Plymouth have only solidified my firm belief that Torque Thrusts look good on almost everything. Whether you agree or disagree, $13,500 will buy you this old Buick and the opportunity to go top down cruising with whatever wheels you desire.